Interstate 95 (I-95) is the main Interstate Highway on the East Coast of the United States, running from U.S. Route 1 (US 1) in Miami, Florida to the Houlton–Woodstock Border Crossing with New Brunswick, Canada. The highway runs largely parallel to the Atlantic Ocean coast and US 1, serving areas from Florida to Maine. In general, I-95 serves the major cities of the Eastern Seaboard and metropolitan areas such as Miami, Jacksonville, Savannah, and Fayetteville in the Southeast; and Richmond, Washington, D.C., Baltimore, Wilmington, Philadelphia, and New York City in the Mid-Atlantic States up to New Haven, Providence, Boston, and Portland in New England. The route follows a more direct inland route between Savannah and Washington, D.C., notably bypassing the coastal metropolitan areas of Charleston and Norfolk-Virginia Beach, which require connections through other Interstate Highways. I-95 is one of the oldest routes of the Interstate Highway System. Many sections of I-95 incorporated pre-existing sections of toll roads where they served the same right of way. Before I-95 was completed in September 2018, the last gap in I-95's route was in central New Jersey; the main through routes in the area had been I-295, I-195, and the New Jersey Turnpike. With a length of 1,908 miles (3,071 km), I-95 is the longest north–south Interstate and the sixth-longest Interstate Highway overall. I-95 passes through more states than any other Interstate Highway at 15 states (as well as a very brief stretch in the District of Columbia while crossing the Potomac River). According to the U.S. Census Bureau, only five of the 96 counties (or equivalents) along the route are completely rural, while statistics provided by the I-95 Corridor Coalition suggest that the region served is "over three times more densely populated than the U.S. average and as densely settled as much of Western Europe". According to the Corridor Coalition, I-95 serves 110 million people and facilitates 40 percent of the country’s gross domestic product. Interstate 95 bridge over Lake Marion, Santee, SC; the old bridge (on the left) was abandoned and converted to a fishing pier, but is now closed even to pedestrian traffic. Northbound I-95 at its interchange with I-40 near Benson, NC, c. 2009. This interchange has since been renovated. Woodrow Wilson Bridge carrying I-95/I-495 across the Potomac River, Washington D.C.
I-95 northbound at Washington Boulevard, Baltimore, MD. I-95 uses an elevated viaduct entering Wilmington, DE from the southwest. I-95 begins at U.S. Route 1 just south of downtown Miami and heads north through Ft. Lauderdale, West Palm Beach, the Gold Coast, Treasure Coast, Space Coast, Daytona Beach, Port Orange, Saint Augustine, and then Jacksonville before entering the U.S. state of Georgia near Brunswick. This portion of the highway was notably featured in the film Flight of the Navigator when the spaceship flew along the highway towards Miami. In Miami and Ft. Lauderdale, SunPass Express lanes pass over the highway. Prior to 1987, a notable gap used to exist between West Palm Beach and Fort Pierce where I-95 traffic was diverted to Florida's Turnpike. Today, that routing runs parallel with the turnpike. In the year 2010, the Florida section of I-95 had the most fatalities of all Interstate Highways. The Georgia section of Interstate 95 travels through the marshlands closely following the coastline but bypassing the cities of Brunswick and Savannah. It intersects Interstate 16 and then crosses into South Carolina. The exit numbers were converted from a sequential system to a mileage based system around the year 2000. In the Carolinas, I-95 travels west of the coastal sections and indirectly serves popular destinations such as the Outer Banks, Myrtle Beach, and Hilton Head via various side routes. I-95 notably bypasses the major cities of Charleston and Raleigh while intersecting major Interstate highways at Florence and Benson. I-95 also passes the South of the Border attraction immediately before crossing into North Carolina. In North Carolina, I-95 informally serves as the separation between the state's western piedmont and eastern coastal plain regions. Rocky Mount and Fayetteville are the largest cities along I-95 in North Carolina. After Gaston, I-95 crosses into Virginia. For the short portion of the interstate in Washington, D.C., see Woodrow Wilson Bridge. I-95 enters the Mid-Atlantic region in Virginia and travels through some of the most populated areas along the east coast. I-95 is concurrent briefly with I-64 in the middle of Richmond before heading toward Northern Virginia. In the Washington Metropolitan Area, it is concurrent with the Capital Beltway, passing through the southernmost corner of the District of Columbia for about 0.11 miles (0.18 km) via the Woodrow Wilson Bridge before entering Maryland where it bends away from the Beltway toward Baltimore. From the tunnels of Baltimore to the bridges of New York, I-95 is mostly a tolled road. I-95 connects to an unsigned portion of the New Jersey Turnpike via I-295 near Wilmington, DE where drivers can bypass Philadelphia through South Jersey between exits 1 and 6. I-95 itself passes through Philadelphia, enters New Jersey on the Delaware River–Turnpike Toll Bridge and runs concurrently with the New Jersey Turnpike north of exit 6. I-95 connects to New York via the George Washington Bridge. I-95 in New York comprises several named expressways, the Trans-Manhattan Expressway, the Cross Bronx Expressway, the Bruckner Expressway, and the New England Thruway. From New Jersey, it is briefly co-signed with U.S. 1 and U.S. 9 (U.S. 9 quickly exits in NY and heads toward Broadway and U.S. 1 stays on I-95 to the Webster Ave exit). There are many interchanges within this 23-mile (37 km) stretch that connects New York City to Albany, Upstate New York, and Long Island. I-95 then becomes the New England Thruway to Connecticut, where it continues as the Connecticut Turnpike. I-95 enters New England in the state of Connecticut, and follows along the southern part of the state within miles of the coast in a more east–west direction. In New Haven, I-95 intersects the south end of I-91. It then gradually curves back northward, passing through Rhode Island's capital of Providence. The highway then enters Massachusetts heading around Boston via Route 128 before turning north and passing briefly into and through New Hampshire, and then into Maine, following the Maine Turnpike to Augusta and continuing as a free highway to the Houlton–Woodstock Border Crossing. It intersects US 1 and the east end of US 2 before entering the province of New Brunswick as Route 95. Many parts of I-95 were made up of toll roads that had already been constructed or planned, particularly in the northeast. Many of these routes still exist today, but some have removed their tolls. Outside of Florida, current I-95 toll facilities are compatible with the E-ZPass electronic payment system; in Florida, while I-95 can be driven toll-free, use of the '95 Express Managed Toll Lanes' requires a SunPass transponder. The toll roads utilized as part of I-95 formerly included Florida's Turnpike, the Richmond–Petersburg Turnpike (tolled until 1992), and the Connecticut Turnpike (tolled until 1985). Additionally, the Fuller Warren Bridge, spanning the St. Johns River in Jacksonville, Florida, was tolled until the 1980s. Today, tolls remain on the Fort McHenry Tunnel, the John F. Kennedy Memorial Highway, the Delaware Turnpike, the Pennsylvania Turnpike, the New Jersey Turnpike, the George Washington Bridge, the New England Thruway, the New Hampshire Turnpike, and the Maine Turnpike. Until 2018, a gap existed on I-95 within New Jersey. From Pennsylvania, I-95 entered the state on the Scudder Falls Bridge, and continued east to US 1 in Lawrence Township. Here, I-95 abruptly ended and transitioned into I-295. From New York, I-95 entered the state on the George Washington Bridge and followed the New Jersey Turnpike south to exit 6, ran along an extension of the turnpike, and ended on the Delaware River–Turnpike Toll Bridge at the Pennsylvania state line, where the route transitioned into I-276. This discontinuity was caused by the 1983 cancellation of the Somerset Freeway, a planned alignment of I-95 further inland from the turnpike. In order to close the gap, an interchange was constructed where I-95 crosses the Pennsylvania Turnpike in Bristol, Pennsylvania. After the first components of the interchange opened on September 22, 2018, I-95 was rerouted onto the Pennsylvania Turnpike, meeting up with where I-95 previously ended at the state line. This project closed the last remaining gap in the route. The former section of I-95 between the Pennsylvania Turnpike and US 1 in Lawrence became an extension of I-295. The interchange with the Pennsylvania Turnpike will be expanded in the future, connecting northbound I-95 with the westbound turnpike, and the eastbound turnpike with southbound I-95. Between Richmond, Virginia, and New Jersey a few large projects were undertaken that are helping to ease traffic along the corridor. The reconstruction of the Springfield Interchange in Northern Virginia, just outside Washington, D.C., helped to ease traffic at the intersection of I-95, I-495, and I-395, and surrounding interchanges. The Springfield Interchange is one of the busiest highway junctions on the East Coast, serving between 400,000 and 500,000 vehicles per day. With the exception of HOT lanes on the Capital Beltway (I-495/I-95), this project was completed in July 2007. A few miles to the east was another major project: the Woodrow Wilson Bridge replacement. The bridge carries I-95/I-495 over the Potomac River. The former Woodrow Wilson Bridge, which has since been demolished, was a six-lane bridge that was severely over-capacity. The new bridge is actually two bridges with a total of 12 lanes; five in each direction, with an additional lane in each direction for future use (rapid-bus or train). This project was completed with the 10 lanes opened on December 13, 2008, greatly reducing the traffic delays on the beltway. The lanes are divided into two thru-lanes and three local lanes in each direction. About 30 miles (48 km) north of the Wilson Bridge, and about 20 miles (32 km) south of Baltimore near Laurel, Maryland, construction on a large new interchange began in 2008, was scheduled for completion in late 2011, and opened to traffic on November 9, 2014, which connects I-95 to Maryland Route 200. In 2006, the Virginia General Assembly passed SJ184, a resolution calling for an interstate compact to build a toll highway between Dover, Delaware, and Charleston, South Carolina, as an alternative to I-95 that would allow long-distance traffic to avoid the D.C. Metropolitan area. Federal legislation has identified I-95 through Connecticut as High Priority Corridor 65. A long-term multibillion-dollar program to upgrade the entire length of I-95 through Connecticut has been underway since the mid-1990s and is expected to continue through at least 2020. Several miles of the Connecticut Turnpike through Bridgeport were widened and brought up to Interstate standards. Work has shifted to reconstructing and widening 12 miles (19 km) of I-95 through New Haven, which includes replacing the Pearl Harbor Memorial Bridge. Environmental studies for reconstructing and widening 60 miles (97 km) of I-95 from New Haven to the Rhode Island state line are also progressing. There are plans to expand the 1,054-mile (1,696 km) I-95 corridor from Petersburg, Virginia, to Florida through a U.S. multi-state agreement to study how to improve the corridor through widening and reconstruction, with the goal of reducing congestion and improving overall safety for years to come. I-95 from the South Carolina–Georgia line to the freeway's southern terminus in South Florida has been widened to a minimum of six lanes. The section from Jacksonville to the I-4 junction in Daytona Beach was expanded to six lanes in 2005. Projects begun in 2009, widening the roadbed in Brevard County from the SR 528 junction in Cocoa to Palm Bay, as well as in northern Palm Beach County. The last segments of I-95 in Florida to remain at only four lanes have now been upgraded, providing motorists with about five-hundred miles of continuous six-lane roadbed. In 2009, state legislators representing Maine's Aroostook County proposed using federal economic stimulus funds to extend I-95 north to Maine's northernmost border community of Fort Kent via Caribou and Presque Isle. The proposed route would parallel New Brunswick's four-lane, limited access Trans-Canada Highway on the U.S. side of the Canada–United States border. Legislators argued that extension of the Interstate would promote economic growth in the region. Interstate 95 has many auxiliary routes. They can be found in most states the route runs through; with exceptions being Georgia, South Carolina, and New Hampshire. Business Routes also exist in both Georgia and North Carolina. Interstate 195 is a short spur from north of downtown Richmond south into downtown. Interstate 295 is a bypass to the east of Richmond, from I-95 south of Petersburg, across Interstate 64 east of Richmond and I-95 north of Richmond to I-64 west of Richmond. Interstate 395 is a branch from Springfield north into downtown Washington, D.C. It was part of I-95 until 1977. Interstate 495 is the Capital Beltway, a full loop around Washington, D.C. Since 1977, I-95 has run along its east half. Interstate 295, a southern route into Washington D.C.
Interstate 295 runs southeast from the Bruckner Interchange along the Cross Bronx Expressway, then south over the Throgs Neck Bridge and Clearview Expressway to its terminus at Hillside Avenue, just south of the Grand Central Parkway. It was once signed as part of I-78 and was planned to terminate at the John F. Kennedy International Airport. Interstate 495 runs from the Queens–Midtown Tunnel east along the Long Island Expressway to Riverhead, crossing I-295 in Queens. It was once planned to continue west to I-95 in New Jersey; that part is now Lincoln Tunnel and New Jersey Route 495. It was also to go east and meet I-95 again in either Connecticut or in Rhode Island. This would have made I-495 a bypass road for I-95. Interstate 695 is a short route along the Throgs Neck Expressway, connecting I-295 to I-95 in the Bronx. It was once signed as part of I-78. The number had been used for other plans, including a route parallel to Woodhaven Boulevard and an upgrade of the West Side Highway and Henry Hudson Parkway. Interstate 395 runs from the junction with I-95 in Waterford north to the Massachusetts state line where it meets Interstate 90 / Massachusetts Turnpike and Interstate 290 south of Worcester, Massachusetts. ^ a b c d Sofield, Tom (September 22, 2018). "Decades in the Making, I-95, Turnpike Connector Opens to Motorists". Levittown Now. Retrieved September 22, 2018. ^ a b c Staff (October 31, 2002). "Table 1: Main Routes of the Dwight D. Eisenhower National System of Interstate and Defense Highways as of December 31, 2017". Route Log and Finder List. Federal Highway Administration. Retrieved October 22, 2018. ^ Montgomery, David & White, Josh (February 23, 2001). "128 Cars, Trucks Crash in Snow on I-95". The Washington Post. p. A1. ^ Samuel, Peter (December 10, 2010). "Penn Pike Moving—Very Slowly—To End Gap in I-95". TollRoadsNews. Archived from the original on December 13, 2010. Retrieved December 10, 2010. ^ El Nasser, Haya (June 27, 2004). "Small-Town USA Goes 'Micropolitan'". USA Today. ^ "I-95 Corridor Facts". I-95 Corridor Coalition. March 30, 2008. Retrieved August 20, 2010. ^ Griffin, Riley (August 20, 2018). "No Thanks to New Jersey, I-95 Is Finally Done 60 Years Later". Bloomberg. Retrieved August 20, 2018. ^ "Flight of the Navigator (1986)". ^ Google (June 8, 2009). "Southern Terminus of I-95 at Miami, Florida" (Map). Google Maps. Google. Retrieved June 8, 2009. ^ "I-95 'Missing Link' Okayed". Lakeland Ledger. April 19, 1973. p. 4A. ^ "Gap In I-95 To Close Saturday". Miami Herald. December 13, 1987. p. 1A. ^ Tom Barlow (July 13, 2010). "Most deadly times, places to drive". Walletpop.com. Retrieved October 23, 2014. ^ "Georgia's Interstate Exit Numbers". Georgia Department of Transportation. June 12, 2003. Archived from the original on February 15, 2004. Retrieved April 30, 2007. ^ "Miscellaneous Interstate System Facts". Federal Highway Administration. April 6, 2011. Retrieved August 28, 2013. ^ "I-95/I-295 Signing Redesignation Project Overview". New Jersey Department of Transportation. February 21, 2018. Retrieved April 12, 2018. ^ Google (September 22, 2018). "Interstate 95 in New York" (Map). Google Maps. Google. Retrieved September 22, 2018. ^ Google (September 22, 2018). "I-95 In New England" (Map). Google Maps. Google. Retrieved September 22, 2018. ^ Schleck, Dave (July 17, 2002). "Exceptions to the law allow I-90 tolls in some states". Daily Press. Newport News, Virginia. Retrieved September 22, 2018. ^ "Pennsylvania Turnpike/Interstate 95 Interchange Project". ^ "SJ 184 Interstate Route 95; Construction and Operation of Controlled-Access Highway as Alternative Thereto". Virginia Legislature. Archived from the original on May 24, 2011. ^ Drewes, Britt (February 3, 2009). "Five States and USDOT Partner to Improve Interstate 95 Through Corridor of the Future Program: Development Agreement Aims to Reduce Congestion, Increase Safety and Reliability" (Press release). Virginia Department of Transportation. CO-0903. Archived from the original on February 11, 2009. ^ "Aroostook Delegation Pushes for I-95 Extension". Bangor Daily News. April 10, 2009. Retrieved January 29, 2013. ^ a b c New York State Department of Transportation (January 2017). Official Description of Highway Touring Routes, Bicycling Touring Routes, Scenic Byways, & Commemorative/Memorial Designations in New York State (PDF). Retrieved January 15, 2017. ^ a b Zupan, Jeffrey M.; Barone, Richard E.; Lee, Mathew H. (January 2011). "Upgrading to World Class: The Future of the New York Region's Airports" (PDF). Regional Plan Association. Archived from the original (PDF) on September 24, 2015. Retrieved March 15, 2017. ^ Cliness, Francis X. (March 25, 1971). "Lower Manhattan Road Killed Under State Plan". The New York Times. p. 78. Retrieved April 14, 2010. ^ Fowle, Farnsworth (October 23, 1968). "Van Wyck Roads Are Under Study: Better Use of Service Lanes Sought for Kennedy Traffic". The New York Times. Retrieved March 15, 2017. ^ "Expressway Plans". Regional Plan News. Regional Plan Association (73–74): 1–18. May 1964. Retrieved February 27, 2017. ^ Expressway Plans. Regional Plan Association. 1964. Retrieved April 19, 2018 – via nycroads.com. ^ New York State Highways (Map). Cartography by Rand McNally and Company. State of New York Department of Commerce. 1969. Evans, Mark T. (2015). Main Street, America: Histories of I-95 (Ph.D. dissertation). University of South Carolina. 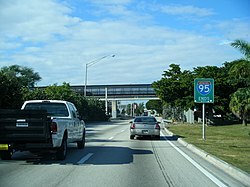 Wikimedia Commons has media related to Interstate 95. I-95: The Road Most Traveled (special series). National Public Radio. 2010.